You may already know that Digital Paxton will serve as a companion to the graphic novel, exhibition, and educators’ institute that the Library Company of Philadelphia pursues through Redrawing History: Indigenous Perspectives on Colonial America. What you might not know is that the project has evolved—and continues to evolve—in its own right. In this post, I’ll look back at the past 18 months since the project launched in order to highlight some milestones and to identify some future opportunities. 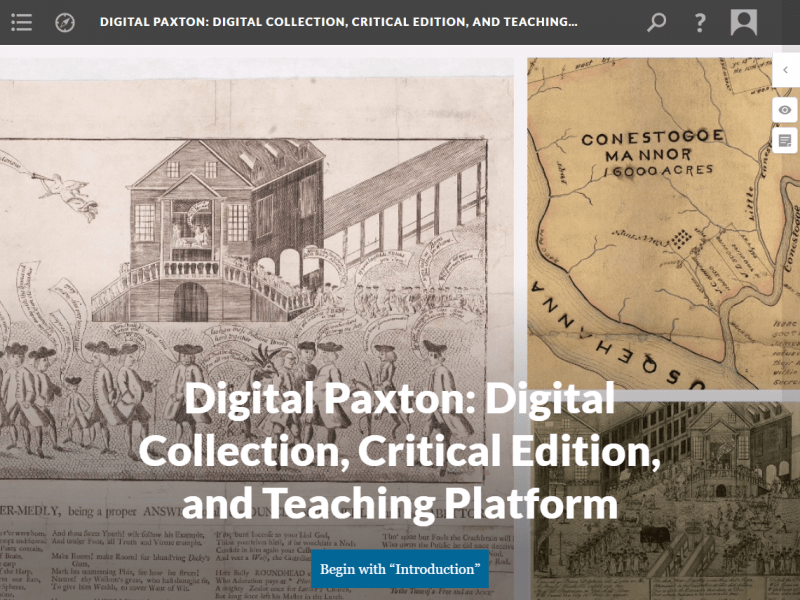 Digital Paxton opened for business in April 2017 alongside my (modest) exhibition at the Library Company of Philadelphia, “A New Looking-Glass for the 1764 Paxton Pamphlet War,” and a Friday seminar (with Scott Paul Gordon) at the McNeil Center for Early American Studies. Today, both of those platforms endure online: I translated the exhibition into a digital pathway, which locates the Paxton massacre in a larger crisis of indigenous dispossession and democratic representation, and published an expanded version of my McNeil talk through Common-place: the journal early American life (17.4: Summer 2017). Certainly, the project had generous attention in its early days. 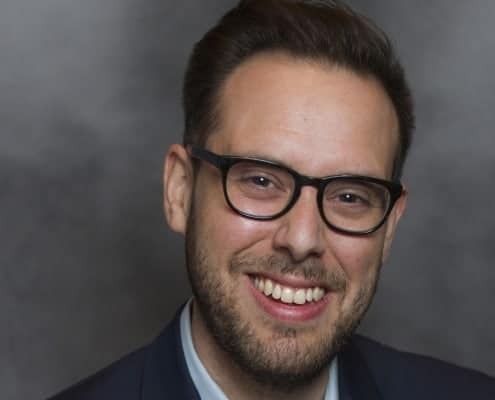 NYCDH, the New York Metropolitan Digital Humanities Consortium, awarded the project first prize in its Graduate Student Project Awards (2016-17), and the Philadelphia Inquirer published a generous write-up of the project (January 2017). However, given that the project was already fairly mature as a digital collection and scholarly edition, my primary priority for the first year was to get it out into the world through various forms of public engagement. panel on the future of the dissertation at the MLA Connected Academics Summer Institute (September 2017). I also promoted the project within the regional GLAM community through remarks at the Philadelphia Archives Month (October 2017) and the Library Company of Philadelphia Annual Dinner (November 2017). Alongside those public talks, a collaboration with Benjamin Bankhurst (Shepherd University) and Kyle Roberts (Loyola University) brought new educational possibilities to the project. Thanks to a partnership with Bankhurst and Roberts on a transcription assignment built the project’s Friendly Association records, Digital Paxton gained new, student-created transcriptions. In the process, we also developed a platform and documentation through which other faculty may create similar assignments. While much of my free time between the fall of 2017 and spring of 2018 was spent grant-writing for our proposal with The Pew Center for Arts and Heritage, the project has continued to grow in meaningful ways. First, thanks to a Digital Collections Fellowship from the Omohundro Institute of Early American History and Culture, I was able to digitize some two-dozen issues of the Pennsylvania Gazette available at the American Antiquarian Society. Those new records have opened up an entirely new pathway in the project’s Digital Collection (newsprint), and for the first time make the Gazette accessible to researchers outside of the Readex paywall, as I discuss in a post for the Uncommon Sense blog (June 2018). Also in the summer of 2018, I highlighted the project’s functionality as a teaching platform on the Organization for American Historians blog (May 2018) and as a digital collection at HILT 2018 (University of Pennsylvania, June 2018). 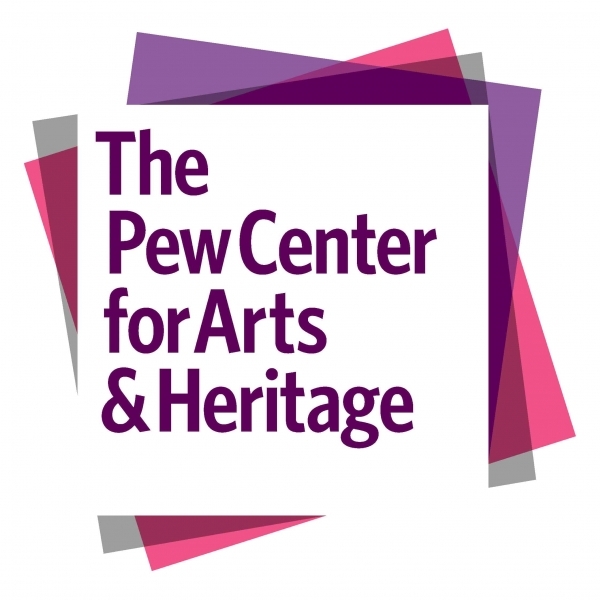 Of course the big 2018 news is The Pew Center for Arts & Heritage award to the Library Company of Philadelphia. Nested within that award is new funding for digitization and contextualization. Over the past several months, I have had the opportunity to identify, solicit, and ingest remarkable new records from LancasterHistory.org, the Presbyterian Historical Society, and the Kislak Center for Special Collections, Rare Books and Manuscripts. Readers can expect a range of new primary and secondary source materials to be added to the project in the coming months. Follow us on social media (Twitter or Facebook) or bookmark this blog for all the latest updates!